Tauck's Canadian Rockies vacation is packed with breathtaking scenery, adventure and natural history as you explore Banff, Jasper and Yoho national parks. Go flightseeing by helicopter over the Three Sisters Peaks... climb up the surface of a glacier on an Ice Explorer... learn park history, legends and folklore at a presentation by a Parks Canada official... keep an eye out for elk, bighorn sheep, moose and grizzlies... discover the Icefields Parkway... explore Jasper National Park "your way" with a choice of wilderness adventures... attend an educational wine tasting... learn about aboriginal cultural at a national parks presentation... and stay in the Canadian Rockies' best resorts – at The Fairmont Banff Springs and The Fairmont Jasper Park Lodge, and in lake-view rooms at The Fairmont Chateau Lake Louise. Tour departs at 2:30 PM from Calgary International Airport. For guests who are spending the previous night in Calgary, an airport transfer from Calgary International Airport to The Westin Calgary is included; pick-up time today will be 1:00 PM at The Westin Calgary. Your trip begins with a journey from Calgary that takes you across the last few miles of Canadian prairie to Kananaskis country, the foothills of Canada's Rocky Mountains. Join us tonight for a Wild West-themed welcome reception and dinner with music at Boundary Ranch. Weather permitting, start the day with a morning helicopter excursion* that showcases the stunning Three Sisters Peaks. Then head high up into the Canadian Rockies and cross the Continental Divide through Kicking Horse Pass on a day of Alberta travel on which you'll see some of the most beautiful lakes in North America, including Lake Louise, where you'll have lunch. Later, enter Yoho National Park, where Emerald Lake sparkles with the surrounding peaks reflected in the green waters; see the Spiral Tunnels, a century-old engineering feat created for the Canadian Pacific Railway, and Natural Bridge, a rock formation over the Kicking Horse River. Arrive at your historic château-style resort hotel on the edge of Lake Louise overlooking Victoria Glacier in Banff National Park, where you'll enjoy lake-view accommodations during your two-night stay; have dinner at the hotel tonight. Fairmont Chateau Lake Louise is one of the world’s most-often photographed hotels and is one of Canada’s most renowned resorts. Built in 1890, this elegant hotel is set in the midst of extraordinary Banff National Park. Exuding old-world charm, this fine hotel is known to many as “the diamond in the wilderness.” Welcoming guest rooms, with their alpine decor, offer all the modern amenities that today’s sophisticated travelers expect. The well-equipped Health Club facilities include an indoor swimming pool and state-of-the-art exercise equipment. With its signature Palladian window offering stunning views of Victoria Glacier and rugged mountain peaks, the Lakeview Lounge is the perfect place for a pre-dinner cocktail. Fairmont Chateau Lake Louise richly deserves its five-star rating. Nestled in the midst of majestic Jasper National Park, Fairmont Jasper Park Lodge is the epitome of rustic elegance. Once the world’s largest single-story log structure, today the hotel delights sophisticated travelers. Recent major guest room renovations pay homage to the beautiful surroundings, original inhabitants and the historical beginnings of Jasper National Park; the new design takes full advantage of the stunning surroundings and brings the essence of the Rocky Mountains indoors. Enjoy amenities and hospitality in combination with countless opportunities for adventurous activities in a pristine wilderness location. The Health Club facilities include an outdoor heated swimming pool, an indoor whirlpool, an exercise room, and sauna, while the welcoming Fairmont Spa waits with pampering treatments. Continue your Alberta vacation with a day spent exploring magnificent Jasper National Park with your choice of an included "Jasper Your Way" discovery tour. You may choose from among an Athabasca River whitewater rafting adventure* led by Rocky Mountain River Guides; a "Wildlife Discovery Tour," joining a wildlife interpreter to search for bear, elk and more; or a trip on the Jasper Tramway through alpine tundra, leading to the interesting alpine town of Jasper. Or you may want to engage in some of the optional activities at your lodge (available at an additional cost) including horseback riding, biking, tennis, golf, fishing or boating. A park official shares insights on aboriginal culture during a presentation late this afternoon. Retracing your route along the Icefields Parkway back to Banff National Park today, you'll appreciate the region's spectacular scenery from several perspectives. Take a memorable ride across the surface of Athabasca Glacier on an Ice Explorer, a specially designed glacial vehicle, for a close look at the glacier's geological features – another highlight of your Alberta vacation adventure. Arrive in Banff National Park, the first national park in Canada; your grand hotel, one of the Rockies' finest resorts, was built more than a century ago to resemble a Scottish baronial castle. Built in the style of a Scottish baronial castle, Fairmont Banff Springs lies within the heart of Banff National Park. Well-appointed, cozy guest rooms feature cable TV, coffee maker, iron and ironing board and windows that open. Guests may take advantage of the hotel’s numerous facilities, which include a championship Stanley Thompson-designed golf course (available at additional cost), tennis courts, heated indoor and outdoor swimming pools, a bowling center, beautifully landscaped grounds to explore and the acclaimed Willow Stream Spa. The Waldhaus Pub, one of Banff’s best-kept secrets, offers a wide selection of locally brewed beers and fabulous international dishes while wine lovers can sample Canada’s extraordinary wines at Grapes Wine Bar. Today is yours to explore Banff National Park and environs as you please. You may wish to check out the village of Banff, which, with its spectacular scenery and trendy shops and boutiques, has grown over the decades to rival the chic alpine villages of the American Rockies. 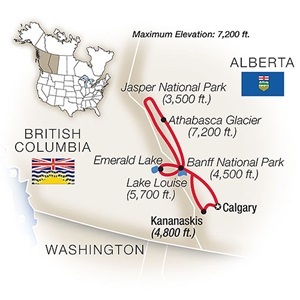 There are also many optional activities to choose from (available at an additional cost) in Banff National Park itself. You can ride the Banff gondola, take a guided nature walk, go horseback riding, mountain biking, or canoeing on the Bow River. Play a round of golf at your world-famous resort, or perhaps book an alpine aromatherapy massage at the Willow Stream Spa, ranked among the top spas in Canada. The week comes to a conclusion tonight at a special farewell reception at The Banff Centre, a world-renowned cultural center where creativity in the performing arts is fostered and new works are created. Your evening includes a special musical performance and dinner overlooking the gorgeous Bow Valley, where the views are a feast for the heart and a great finale to your Alberta vacation. Travel back to Calgary, approximately 80 miles. Tauck's spectacular Alberta vacation experience ends at 10:00 AM at Calgary International Airport. Guests spending additional nights in Calgary will be transferred to The Westin Calgary upon arrival; a transfer from The Westin Calgary to Calgary International Airport is included. Allow a minimum of three hours for check-in.